Please note some images above used more than one kit to make. 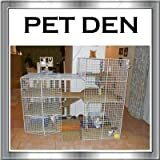 This entry was posted in Small Animals and tagged Cage, Play by One Boutique. Bookmark the permalink.